The very first book we ever read for YA Diversity Book Club was LIKE NO OTHER by Una LaMarche. Now Una has notched another first with us: She's the first author that we've read twice! 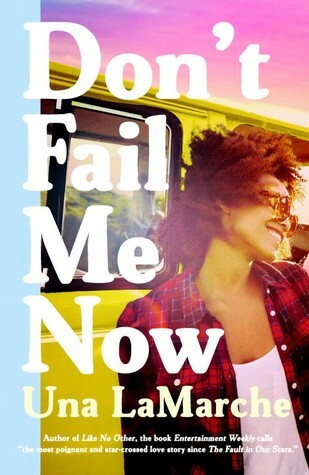 This month's selection was her latest, DON'T FAIL ME NOW, a delightful road trip novel with tons of diversity. In a lot of ways, I am not like Michelle. I am not half-black; I did not grow up impoverished in inner city Baltimore; my mom is not a junkie; and my dad did not abandon me. But in certain ways, I am like Michelle. On a superficial level, being half-Asian I can identify with belonging to multiple cultures and looking mixed. On a much deeper emotional level, I know what it's like to share a father with another family that's very different from my own. My dad was married and had two daughters (and then got divorced) before meeting my mom and having me. I didn't really understand what that meant when I was little, and I didn't meet my half-sisters until I was 9. Like Michelle and Cass with Leah, I think they were wary of me, and maybe a bit resentful. But over time we've gotten to know each other better, we've gotten closer, and we've all realized that no matter what happened between our parents, we're family. I think that theme is the strongest part of DON'T FAIL ME NOW. Family isn't just about blood -- it's about who we choose and how we treat them. DON'T FAIL ME NOW was a fantastic contemporary YA, managing to blend serious issues with humor and hope. I loved it. In a similar but more mature vein, Tayari Jones's SILVER SPARROW also deals with half-sisters and secret families. Hope you'll join us in reading diversely next month! We'll be diving into CARRY ON by Rainbow Rowell, her fantasy spinoff (sort of) from FANGIRL. Great post, Kristan! Don't Fail Me Now is relatable for many reasons and you've really captured the essence here: "Family isn't just about blood -- it's about who we choose and how we treat them." Thanks for this post Kristan! I have several friends who, like you, have blended families in which they're the "babies" with the second (or third) spouse. It was tough for them to know their older siblings resented them (or their parent), but eventually they rose above those differences (it's never the kids' fault) and became friends (well most of them). Thanks for sharing your story and how you related to Michelle.